Transit oriented developments are emerging as vibrant urban neighborhoods, with strong gateways that ensure connectivity within and through the surrounding areas while ensuring streets, parks and open space are ‘Place Makers’. In Vaughan, Ontario, the expansion of the VivaNext bus network and addition of a new subway station created an opportunity to transform this area into a dynamic urban hub. Among the many design principles of high quality design to create spaces with distinct character is the directive to use unique, characteristic and high-quality materials that will harmonize architectural design and reduce long-term maintenance and life-cycle costs. These high-quality materials for streetscapes, parks and open spaces set the precedence for the quality of built forms within the community. 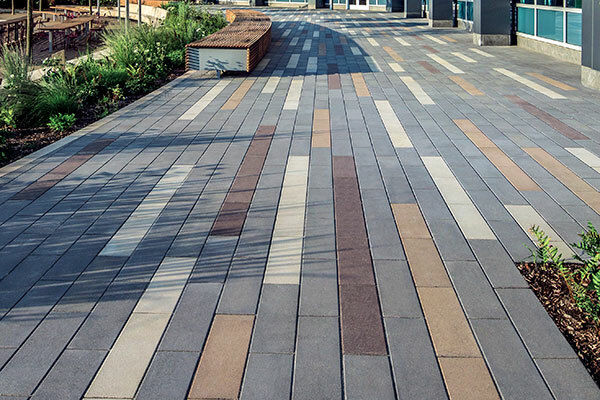 Unilock Promenade Plank Paver was chosen for its shape, lending to trend-setting patterning, while the Series finish was chosen for its outstanding surface durability. Unlike standard thru-mix pavers, the Series finish will only look more beautiful as it wears, exposing more of the product’s natural granite and quartz aggregates. Although the Vaughan Metropolitan Centre is only in the beginning stages of its planned 30 city blocks, the first building features an elongated public park that will stretch across the heart of the area. Its stunning paving pattern has set the stage for future phases, and will serve to visually knit together the new downtown.